Do you live near a factory, a landfill, a farming operation or a gas station? If you do, you should be aware of the possibility of “vapor intrusion”. 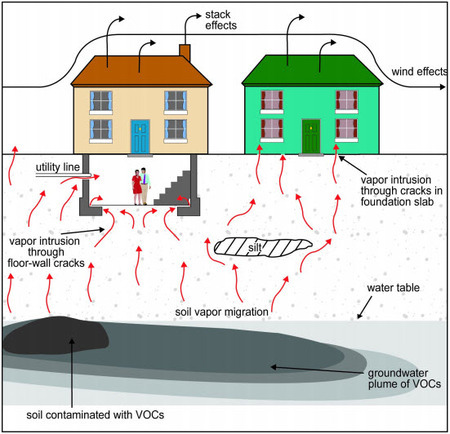 Vapor intrusion is a process in which chemical contamination– which the factory, landfill, etc., caused by disposing of volatile organic compounds (VOCs) in the area soil or groundwater– converts into a gas (called “vapor”) form, which then migrates. This migrating vapor searches for homes and other structures to enter, and can do so through even the tiniest cracks in basement floors and foundation walls. If it does, then the air that the people inside are breathing may be contaminated. This EPA Guide gives you more background on vapor intrusion. If you are concerned that your home may be affected, contact us at (630) 527-1595, and we can help you figure it out. Related Posts: Testing for Vapor Contamination: The Basics, What To Do if Someone Wants to Test Your Property for Vapor Intrusion, Bellaire, Ohio Testing for PCE Vapor Intrusion Should Have Been Done Years Ago, Will the Threat of Vapor Intrusion be Ignored by Trump and Pruitt?